So after a couple long weeks and numerous trips to every home store and super store you can think of, we are finally starting to feel settled into our new home - and pretty much loving it. There is still a lot to do but we will get there... one day. But what we did do is get ourselves a grill. That makes our home official right? I think I took for granted how amazing a grill is in the backyard - out of sight out of mind right? But the last two weekends I have made Sunday night dinner on the grill and loved eating our food al fresco style on our porch, even if we don't have any furniture to eat on. 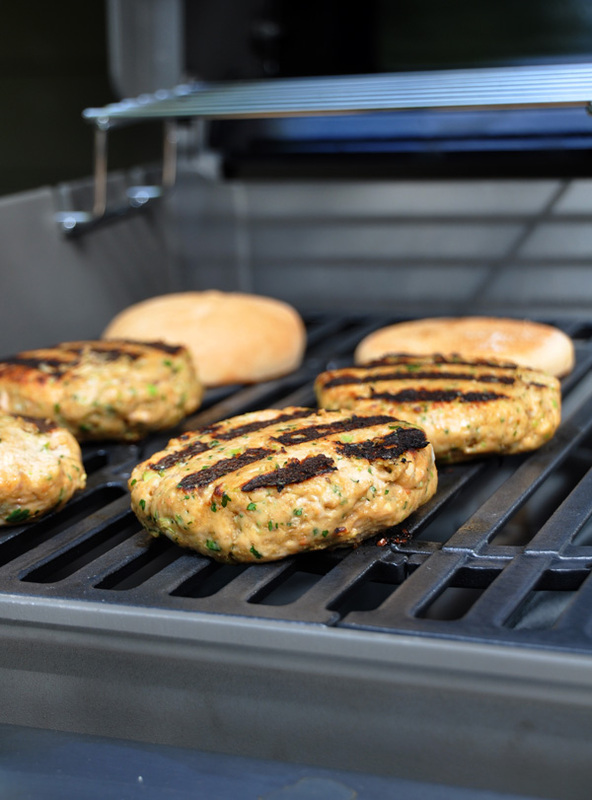 This past Sunday's menu included these salmon burgers which were a HUGE hit. Luke's parents are actually the ones who should get credit for the grill (thank you!!). They graciously gave us a gift card to Home Depot. You know that priorities have shifted when you get a gift certificate to a home improvement store right? But they gave us one so we splurged on a gas grill. Not that silly charcoal thing but a real adult grill that heats up in like 5 minutes. Last weekend I made pizza which was delicious but I think these salmon burgers win in the deliciousness category. Packed with lots of flavor these burgers have an Asian twist. In the burger itself there is green onion, cilantro and hoison sauce. I made a wasabi mayo for the bun and some pickled cucumbers for a little crunch. It is the perfect Sunday night dinner - not too heavy, pretty healthy and very tasty. Something to get you ready for the start of a new week. If you don't have a grill you can make these on a grill pan on your stove top or even sauté them. Or you can just come over and hang out in my new backyard while I break in my new grill. Cocktails included. Place first 6 ingredients in a food processor. Using on/off turns, blend until ground but salmon is still slightly chunky, only a couple pulses. Transfer mixture to medium bowl. Mix in breadcrumbs and salt and pepper. Form into four 1/2-inch-thick patties. Cover; refrigerate at least 1 hour and up to 4 hours. While the salmon is resting make the wasabi mayo by combining wasabi powder with enough mayo to form a smooth paste. Pickle the cucumbers by combining the cucumbers, rice wine vinegar and sesame oil. Salt to taste and set aside. 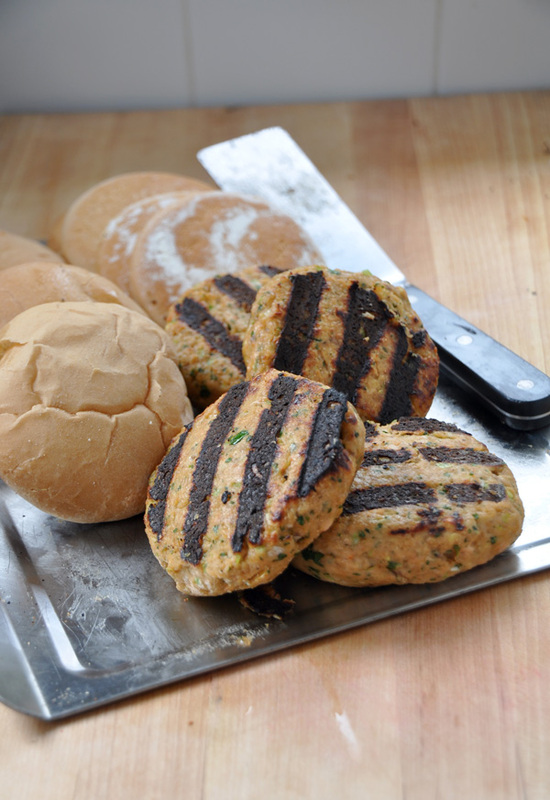 Heat grill or grill pan to medium heat.Grill patties until fish is cooked through, about 3 minutes per side. Meanwhile, toast hamburger buns. When ready to serve, spread bottom halves of buns with additional hoisin. Spread top halves with the wasabi mayonnaise. Transfer burgers to bottom halves of bun; top with pickled cucumbers, black sesame seeds and cilantro. Amanda is a professional cook and food stylist living in Nashville, Tennessee. After culinary school Amanda worked in catering companies, a Michelin starred restaurant, and up until May 2016, was a test kitchen cook in the Williams-Sonoma Test Kitchen. Amanda's site is filled with recipes that she loves to cook for friends and family. Recipes that are easy and delicious and full of flavor. Recipes whose ingredients are not too hard to source and don't have too many steps . Recipes that are not stuffy and overly complicated. Welcome to the way Amanda likes to cook and eat. On her site you will also find how-to cook recipe videos. Amanda breaks down her favorite recipes to help show how simple and straightforward cooking can be.